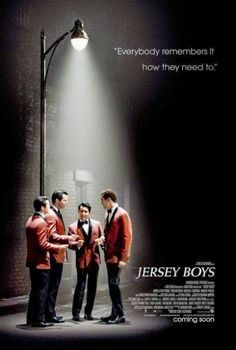 PLOT: The story of four young men from the wrong side of the tracks in New Jersey who came together to form the iconic 1960s musical group The Four Seasons..
Jersey Boys, of course, is the film take on the Tony and Olivier Award winning musical play that tells the dramatised story of rock n’ roll band The Four Seasons. Originally planned as a John Favreau directed movie, a few eyebrows were raised when Clint Eastwood was eventually hired to take the on the rags to riches story of four chancers from Jersey. As I haven’t seen the play I can only comment on how well the film stacks up as a standalone, but there are definite nods to musical theatre, not least with the final scene where all of the cast return for a big song and dance to Oh What a Night. The film is split into its own four seasons as each of the band members narrate their own segment. Tommy takes the first part and claims credit for everything that is about to happen to create The Four Seasons and make a star of Frankie Valli. In truth, apart from running up a million dollar debt his greatest feat is, via his friend Joe Pesci (yes, the Joe Pesci), to introduce the band to song writer Bob Gaudio who joins the band and helps to move them towards stardom. Cue usual tensions, family issues, resentment and other traditional melodrama, before a rousing reunion finale and there you have it. I am not sure how deliberate it was, but Eastwood has managed to make a $40m movie look like an 80s TV biopic and whilst you are supposed to fall under the spell of Valli’s wonderful voice, if anything I was turned off by John Lloyd Young’s screeching interpretation and by the character as a whole. For a film so heavily invested in the audience connecting with its lead, it fell a long way short. There are elements of the band’s tale that are interesting, in particular their relationship with local mobster Gyp DeCarlo (played in typical fashion by Christopher Walken), but they are so rose-tinted that I have trouble believing them. Maybe in the theatre you can get away with a thin and glossed over story by adding another song and dance routine, but as a two hour movie you expect more substance. I wouldn’t expect Jersey Boys to be on any list of Clint’s best films and in truth I would expect the play to be a much better waste of your two hours, but it isn’t all bad. So if you have an interest in 60s rock ‘n roll it may be worth a watch. Just take a huge pinch of salt and some ear plugs for the screechier numbers. A biopic that succeeds in making its lead less likeable than he wants to be and the story less believable than it needs to be.